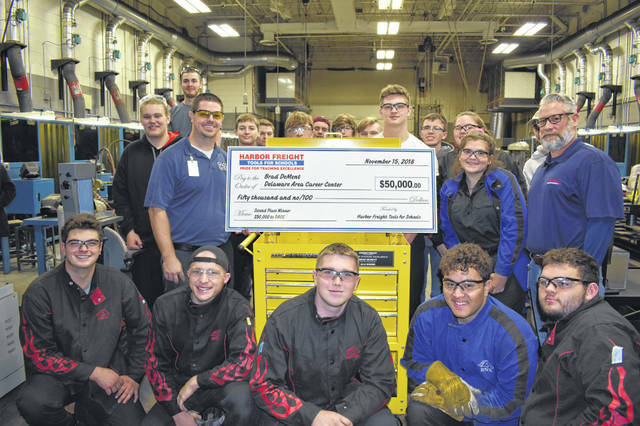 Bradley DeMent, left of check, poses with his students in the Delaware Area Career Center welding lab Thursday after being given a personalized tool cart and a check for $50,000 by Gerald McLarnon, right, a representative from Harbor Freight Tools For Schools. Delaware Area Career Center Welding Instructor Brad DeMent was announced as the second-place winner in the Harbor Freight Tools for Schools Prize for Teaching Excellence, winning $50,000 for his classroom. DeMent was presented a personalized tool cart and check Thursday in his lab at the DACC’s North Campus in the company of school administrators, students, and his wife and parents. Gerald McLarnon, a representative from Harbor Frieght, gave him the check and tool cart. He said DeMent was selected second out of 557 applicants. “You, my friend, are excellent,” McLarnon told DeMent Thursday. McLarnon said that Harbor Freight would be donating $1 million to schools across the country Thursday as part of the competition. DACC North Campus Building Director Chad Williams said DeMent is “a staple” at North Campus, and the school is “very proud” of his work and his recognition. DeMent reported earlier this year that he applied in the competition and had to answer questions about scenarios, learning modules, and describe his program. He was announced as one of 52 semi-finalists in August. DeMent’s welding students cheered him on during the presentation and said they’d known about the award for days and helped school administrators organize the surprise presentation. The students told DeMent that they even had to sign release forms to be in pictures, and Williams fabricated a task for DeMent to complete across the building so they could all sign it at once. DeMent told his students he was genuinely surprised they could keep a secret and lamented that he did, in fact, work to complete the fabricated task he’d been given. DeMent has been teaching since 2011 when he left his job building chassis for top fuel dragsters and nitro cars after he noticed there were many job openings in his field but not enough skilled workers. “I enjoy it,” DeMent said. “It’s kind of great to show these kids what doors (welding) can open,” DeMent said.